Running in Phuket, Thailand. 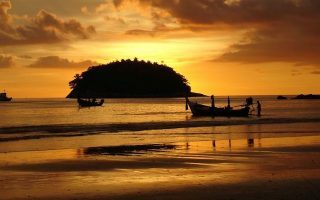 Best routes and places to run in Phuket. 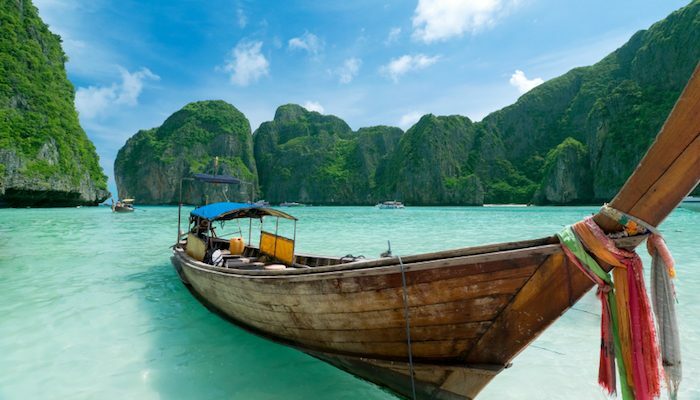 Phuket is a 576 square km island province of southwest Thailand, connected to the mainland by the Sarasin Bridge over the Andaman Sea. 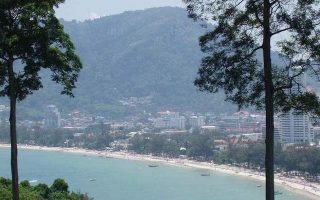 While Phuket Town, on the southeast coast of the island, is the administrative heart of the province, the west coast is a popular destination for beach-going tourists. 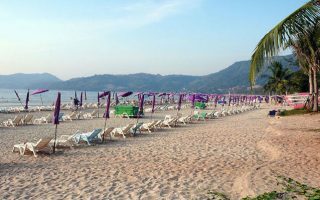 Patong is the most populated of the resort areas, with the beaches growing longer and less crowded as you head north along the shore. 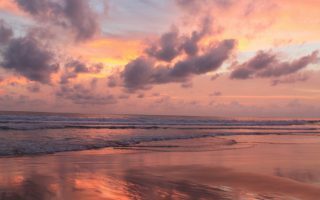 These public beaches are the highlight of running in Phuket, with wide flat stretches of sand ranging for miles up the coast. 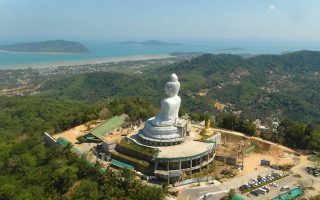 Inland, Phuket grows quite jungly and mountainous, providing lots of options for challenging hill runs with great views of the island. 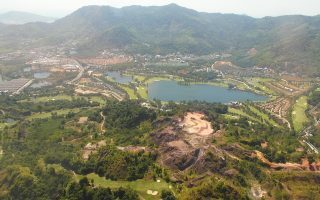 Locals tend to favor running around the uncrowded roads of Phuket’s man-made reservoirs and dams, or else exercising in some of the larger public parks like Saphan Hin or King Rama 9. In the words of one local, “the jungle eats trail very quickly” here, so trail runners should consider joining a local group like the Phuket Hash House Harriers. No matter where you run in Phuket, it’s tough to beat the heat, so make sure to bring plenty of water and try to run in the early morning or evening. NOTE: Driving in Thailand is on the LEFT, so use the RIGHT side of the road to run opposite traffic. There are lots of options for getting around Phuket without a car. The open-air Songtaew busses are the easiest way to connect from Phuket Town to the western resort areas. Blue micro busses offer service around Phuket Town, and an airport shuttle can deliver you back and forth from flights. Otherwise, taxis and tuk tuks are simple, though slightly pricier, methods of transport. But rest assured — we’ve mapped out routes all around Phuket, so you don’t need to travel far to find a great run! Special thanks to the Phuket Fun Club for their help with this guide. Make sure to check out them out for all things active and fun on Phuket! Close to the raucous resort area of Phuket, this beach has a festive — if somewhat crowded — vibe. Sand conditions are great for running, and it’s possible to travel about 2.6 km one way. While still a tourist beach, Karon is less developed than Patong, and the 3 km (one way) of sand here has great running conditions. Sidewalks bordering the beach are also runnable. Shorter than other west coast beaches, but scenic with great runnable sand. 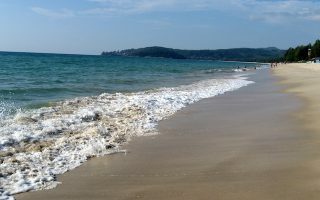 1.6 km can be extended via a connection to Karon Beach. 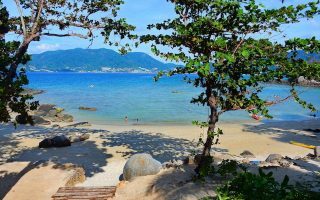 Over 5 km of pristine sands further north along the west coast of Phuket, becoming more remote the further north you travel out to Kala Point. The beach is the main running option here, as there's no road alongside. 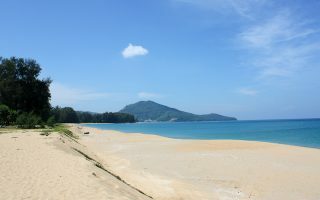 At over 13 km, this is one of the longest stretches of uninterrupted beach on Phuket, bordering the airport and Sirinat Natural Park. 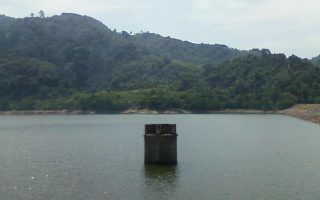 The shady, traffic-free jungle roads around this reservoir are a go-to exercise destination for locals. 4 km (6.4 miles). With easy access from Phuket Town, this is a popular running spot for locals. 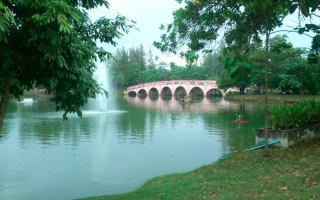 Over 6 km of runnable paths through tropical vegetation, ponds, lawns, and gardens. Popular local hangout bordering a river and Phuket’s east coast. We recommend a DIY loop using the park’s waterfront paths, which is about 3 km. A short hill run up to a shop and restaurant lined terrace overlooking the coast of Phuket Town. 4 km round trip. A favorite hill run up to one of Phuket’s top tourist attractions, with great views of Chalong Bay. 9 km round trip, or catch a ride down the hill. This is a challenging hill run, gaining 1,100 feet over 4.5 km, average 8% grade. This loop around a manmade reservoir is a nice respite from the crowds, and is nearly perfect for 5 km training, with lots of options to extend your route. Great run from Patong Beach to the hills above Paradise Beach. A sidewalk winds most of the way up the hilly and narrow road. Paradise Beach is a great reward for this challenging 11.5 km out and back. 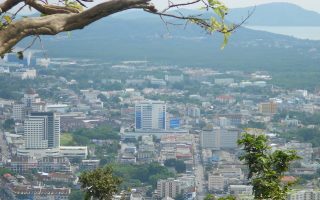 A challenging, hilly route outside of Patong, with great views from the heights near Kalim Hill. 6.5 km of this 11 km loop are around Kalim Hill, with a 2 km very steep section. The remaining 4.5 km are on the flat 4233 road along the beach. The weather is very consistent in Phuket: Hot. Daily hights are 31-32C (near 90F) nearly year-round, with nights rarely dipping below 23C. The only ‘cooler’ running you’ll have is in the air-conditioned hotel gym, or perhaps in a tropical downpour. The one variation in Phuket’s weather is rainfall — December-March is distinctly dry, while the wettest months of May-October can have 15+ inches of rain. If you stay in one of the numerous west coast beachfront hotels, you’re likely to be one of our recommended beaches for running. We also have some good running spots if you’re staying in Phuket Town. 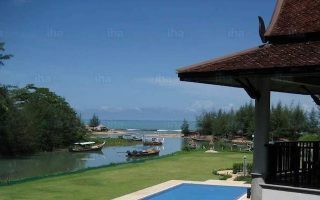 This article from Phuket.com can help you find your ideal place to stay in Phuket! Run Baby Run is a running store in the interior. There’s a centrally located Under Armour Store that has running gear. You won’t find many running stores on Phuket, but there are several options for group runs. Check in with Phuket Fun Club for information on all things Running, Biking, or Swimming in Phuket. The Phuket Hash House Harriers have fun outings including trail runs. Phuket International Sports Club can help our with runs and other methods of training during your visit. JustRunLah.com has a great list of upcoming running events in Thailand.